Learning about mobility scooters online is tricky and time consuming. Many purveyors of mobility scooters (See The Scooter Store, and the Mobility Scooter Buyer's Guide) purport to provide "free information," but really only want you on their mailing list. Some require your name, address, day and night phone numbers, and email before they will give you anything. Of course, you then become the targetof high-pressure sales. Others (See Planet Mobility) do have information that can be accessed without intruding on your privacy, but they do ask you to join up as well. 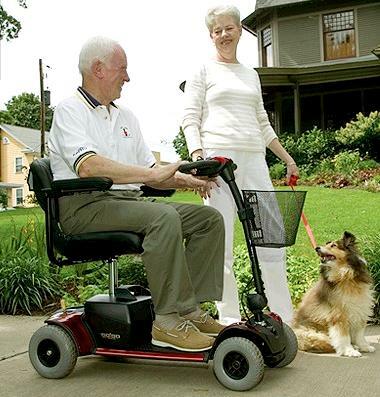 The mobility scooter can make the difference between an active life and a sedentary one. It can bridge the mobility gap between generations and keep families functioning together. On this site we are attempting to provide as much well researched and well documented information as we can to aid in the mobility scooter decision -- no memberships, no mailing lists. A mobility scooter is a three or four-wheeled vehicle with two rear wheels supporting a seat, a platform area for the feet, and a front console for steering the scooter with the one or two front wheels. Normally battery powered, with a fairly extensive range. a mobility scooter can provide freedom to traverse a neighborhood of significant size. They are also generally small enough to travel on public transport. One needn't be in desperate need of a scooter to reap a great deal of benefit from one. 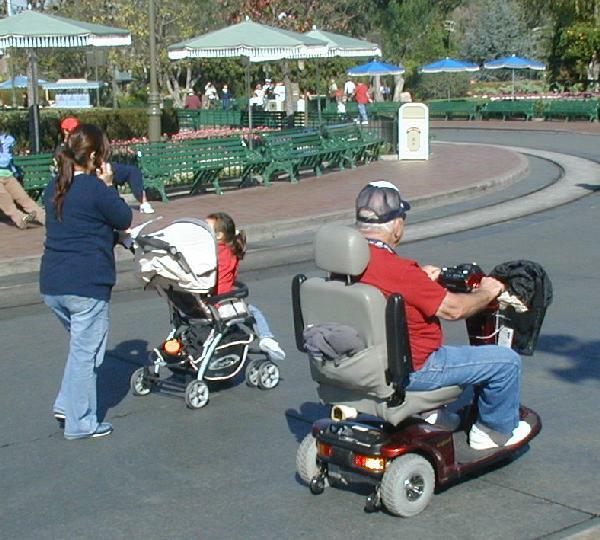 A scooter can help one fit into a group of active people more easily. It can allow a family to do more things together. See Mobility Scooter Lifestyle. The mobility scooter can open up many practical and social opportunities for those whose mobility would otherwise be limited by the inability to stand or walk for any length of time. Given increasing awareness of the needs of the disabled, and the proliferation of accessibility ramps, in many cities, there are few places that a mobility scooter cannot comfortably reach without assistance. Usually more affordable than motorized wheelchairs, Mobility scooters also do not have the same stigma of association with old age and infirmity that wheelchairs do. They may be also be far more appropriate than wheelchairs for persons with certain very common disabilities. The person who lacks the stamina to walk significant distances and the upper body strength to operate a manual wheelchair may find a mobility scooter to be the perfect solution. Some motorskills are required, however, and the ability to sit upright in the chair. The wide range of ergonomic controls available make mobility scooters accessible to persons with a wide range of disabilities. Generally more affordable than wheelchairs, scooters frequently qualify for healthcare or insurance when wheel chairs do not. Those with limited motor facility will also probably find mounting and dismounting a scooter to be easier than manipulating the footrests on a wheelchair. Cannot or prefers not to use a manual wheelchair. Is able to sit upright. Is able to control and navigate the scooter. can take a few steps to mount and dismount the scooter. needs transportation in an area through which a scooter can travel. 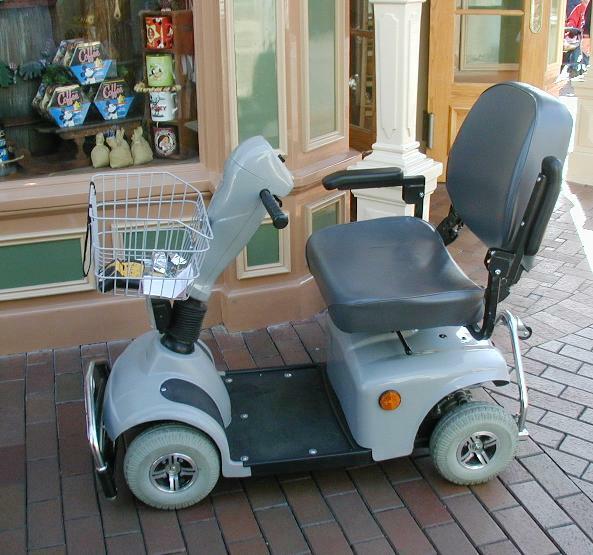 may be well suited to either wheelchair or scooter but considered ineligible for financial assistance for a wheelchair by a healthcare or insurance provider. must navigate through confined spaces that a wheel chair but not a scooter can negotiate (though there are some scooters that do an excellent job at these). are unable to sit in an upright position for long. cannot steer and navigate due to visual or motor impairment. require body or arm support available on wheelchairs but not scooters. Travel scooters are those which can be readily disassembled to fit in the trunk of a car. They are typically not as robust as larger scooters, may lack features such as arm-rests, and may have more limited speed and range. They may have either three or four wheels and usually range in price from $550 to $1550 depending on features and capacity. Three-wheel Scooters are for both indoor and outdoor use and have greater capacity than travel scooters. Four-wheel Scooters Are intended for outdoor use as their turning radii are too large for most indoor spaces. It is expected that one can negotiate supermarkets and malls, however. They generally range from $1300 to $2200. Heavy duty scooters are larger, have greater load limits and often greater speed and range than other scooters. All Electric Scooters carries a wide range of three and four-wheeled mobility scooters from light travel scooters that can easily be dis and reassembled, to heavy duty scooters that are rated for up to 500 lbs. capacity.